The festive season is thought to be one of the most romantic times of the year... but what were the real reasons behind traditional Christmas nuptials? It is not uncommon for family historians to encounter the odd Christmas Day wedding during the course of their family research. While this may appear to suggest that our ancestors shared similar views on the romantic nature of the nation's favourite holiday, the appeal of the date was usually rather practical. During the 18th and 19th centuries, getting married on Christmas Day itself was a popular tradition, with churches across the country holding festive nuptials every December 25th. However, couples who chose to opt for a Christmas Day wedding would have rarely done so out of a desire to capture a sense of seasonal romance. Christmas Day weddings usually occurred out of necessity as Christmas and Boxing Day were often the only days of the year that young working class couples were guaranteed to get off work. Even Charles Dicken's Ebenezer Scrooge was forced to reluctantly give his long suffering clerk, Bob Cratchett, the day off in the opening chapter of 'A Christmas Carol'. In the 1800s, most people worked six days a week and didn't get paid when they didn't work which, of course, the vast majority of people could ill afford. It wasn't like today, when you can simply request a day's holiday to marry on whichever day of the year takes your fancy. It was only with the rise of the labour unions in the twentieth century that working conditions and employee rights started to improve and the tradition began to die out. 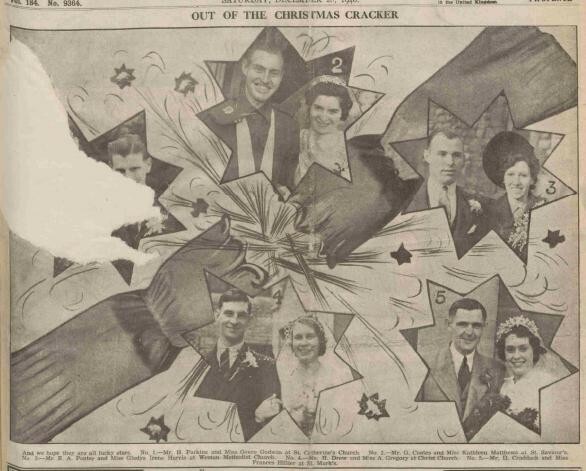 However, enthusiastic reports of Christmas Day weddings can be found within our collection of historic British Newspapers right through the 1940s and even into the early 1950s. Christmas day weddings appear to have been even more common in inner city areas home to large industrial working class communities. In a number of cities, particularly in London, it was a tradition that churches offered free marriages and baptisms on December 25th. Group weddings appear to have been routinely performed east of St. Paul's, and in the poorer quarters city. Penny Weddings, so-called because each of the contracting parties paid this modest sum for the privilege of being united in the bonds of matrimony, were another relatively common form of working class marriages. In fact, they were so common that church ministers would occasionally advertise the speed with which they could perform a ceremony. By the turn of the twentieth century, Penny Weddings had largely died out as inflation meant that even the very cheapest of ceremonies now cost a fee of about six shillings. However, Penny Wedding were still performed on Christmas Day by a number of churches in London as special acts of festive charity. 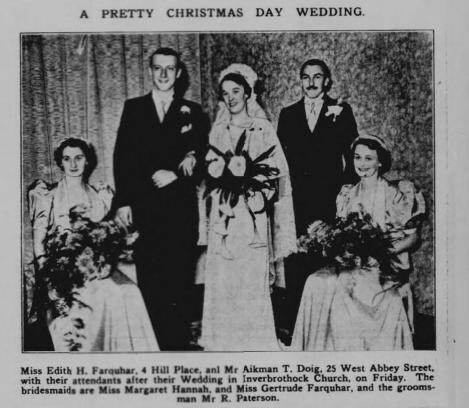 While the practice began to fall out of favour in the early 20th century, Christmas Day weddings enjoyed a brief resurgence during the 1940s as the lives and romances of many young couples were thrown into turmoil by World War 2. The majority of young men were in military service while a significant number of women were conducting essential war work and leave was hard to come by. Many couples used the rare instances of home leave they were given on Christmas day to wed before they were separated and sent off to face uncertain futures. December 25th weddings are now virtually unheard of due to improved working conditions and the reduced availability (and sharp increase in cost) of essentials such as venues, catering and staff during the festive season. 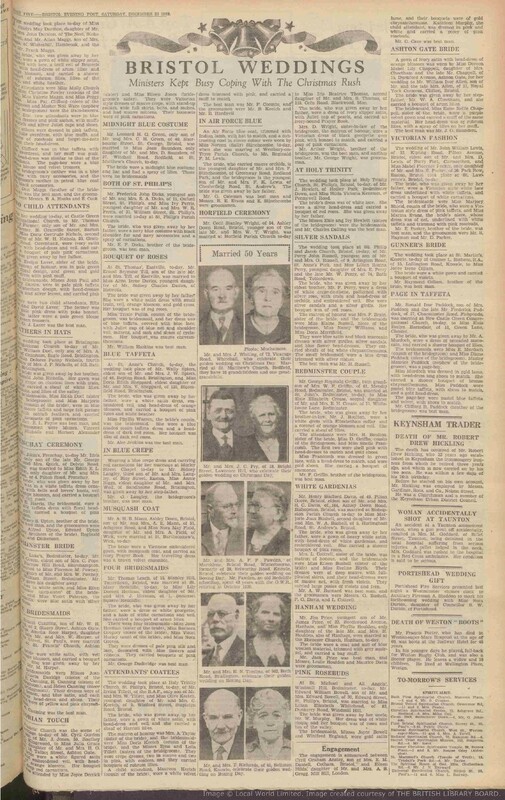 Search our collections of marriage and banns records, as well as our collection of historic newspapers, to discover whether your family tree grew a new branch one Christmas Day long ago.